I have to say it is AWESOME when I've previously scheduled a post to go up and lo and behold, when I pick up my farm share, the featured vegetable for the post is in the box! This week we got a transitional box between Spring and summer produce, with zucchini, yellow squash, turnips, kale, green beans (perfect timing on the Hot French Potato Salad, too) parsley (some went into this pasta and the rest vanished into a food processor full of garlic scape pesto) and carrots. Probably radishes too--oh and chard as well--our farmers really rock at filling up the boxes each week. I made Zucchini Carrot Es-kah-pay (it's a Finding Nemo reference and a bastardization of something in a Giada de Laurentis cookbook-stay tuned) dish that we'll eat in an antipasto platter over the weekend, and if it's good you'll find it here. Eventually. The rest of the carrots and the radishes will be used to scoop up a green garlic hummus I made out of green garbanzo beans and green garlic--so now that I've dealt with the scapes and the green garlic I'm ready to roast and put up the rest of the garlic harvest. But the turnips are looming over my head . . . last weekend I did a simmered & grilled side dish of cubed turnips, potatoes, kohlrabi and radishes that became a very tasty enchilada filling, so I may want to try that with all turnips. But enough about my stream-of-consciousness for today--on to the real post. Some of my best meals occur by opening the fridge and seeing what needs to be used up. A bit of cheese and some pretty vegetables can turn into something surprising. I made this pizza sort of on a whim. Often I obsess over and plot out ingredients combinations . . . which I admit seems really weird . . . but this one was purely a 'it's Friday, what's in the fridge' type of pizza. With all the ways I can shred, cube, or pulverize summer squash and incorporate it in other dishes, I never think to just celebrate the perfection and beauty of a thin circular slice. I see folks making lovely vegetable terrines and tians--and I loved the movie Ratatouille's signature dish presentation--but I never think that I could create such visually stunning food. I admit I'm pleasantly surprised how well this pizza was received by the kids, and how well the photos turned out, though I have no clue why the crust got so fat--perhaps it was having fun rising in the kitchen while I was slicing away. I've got a mind to try similar pizzas this summer. I have a desire to try my hand at making herbed cream cheese and herbed goat cheese since my herb garden [except cilantro, which bolted about 10 days after I planted it] is growing gangbusters. 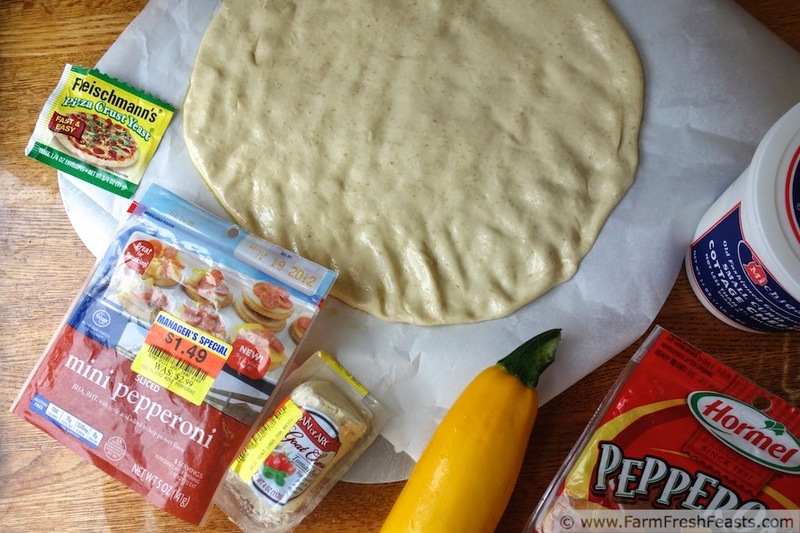 For general hints, tips, and photo collages please check out my Pizza Primer post, a brain dump of all things related to making pizza in my home kitchen. 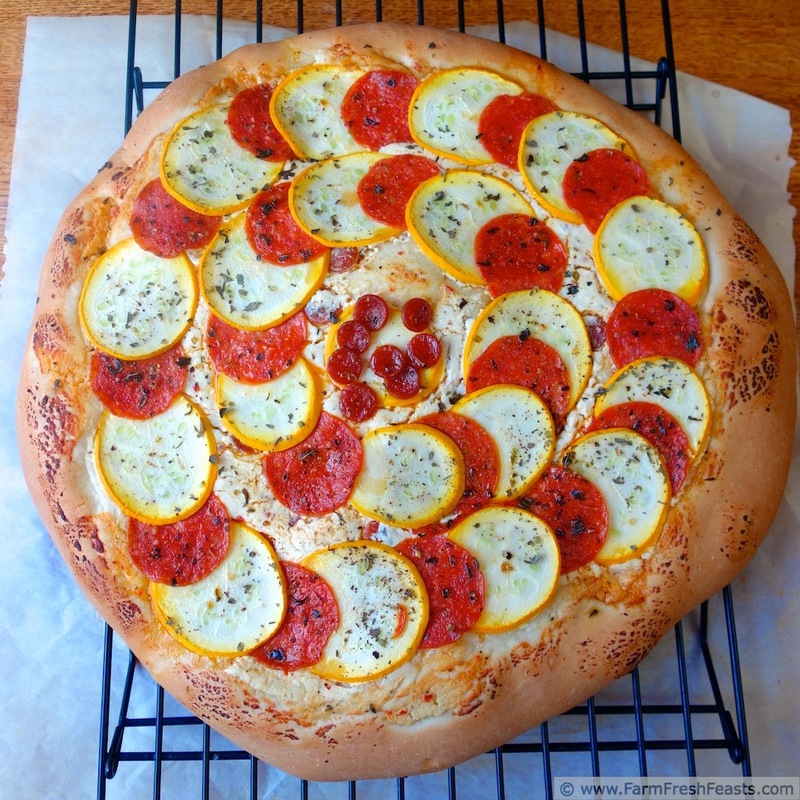 For more pizza ideas, please check out my Visual Pizza Recipe Index. For a photo album of pizza dough troubleshooting tips, please see my FB page. Preheat oven to 425 degrees Fahrenheit, and if you've got a pizza stone add that to the oven now. On an oiled piece of parchment paper stretch out your crust. Brush with a bit of olive oil, then spread goat cheese across the crust leaving a small border. 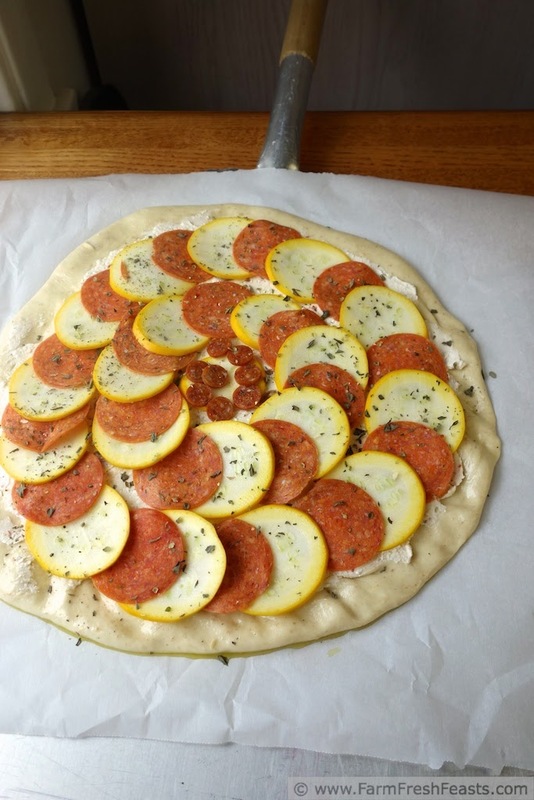 Lay slices of squash and pepperoni on top. Scatter seasonings on top. 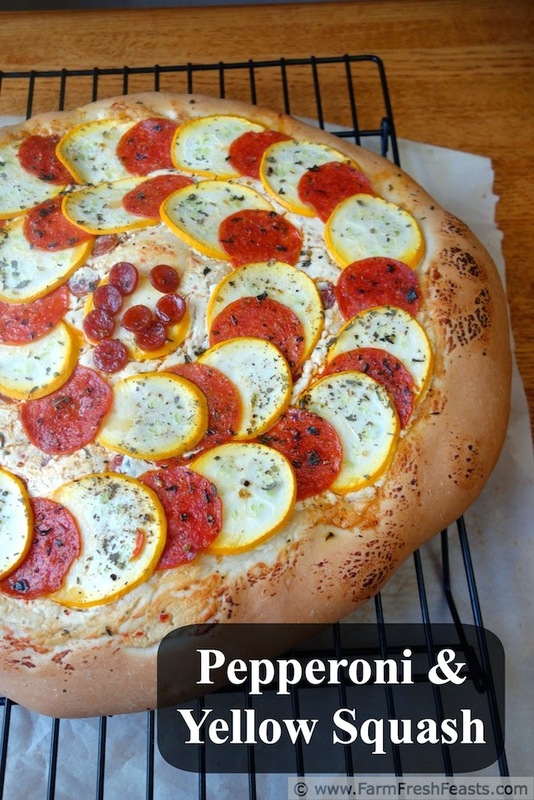 Bake for 5 to 8 minutes, then shimmy the crust off of the parchment paper and bake directly on the stone for another 3 to 5 minutes, until crust is browned and pepperoni is curling up at the edges. Cool on a rack for a couple of minutes, then slice and serve. I love how pretty the circles look, great presentation! I'm pleased with the presentation too! So often I make brown food, so it is a refreshing change to make pretty food. 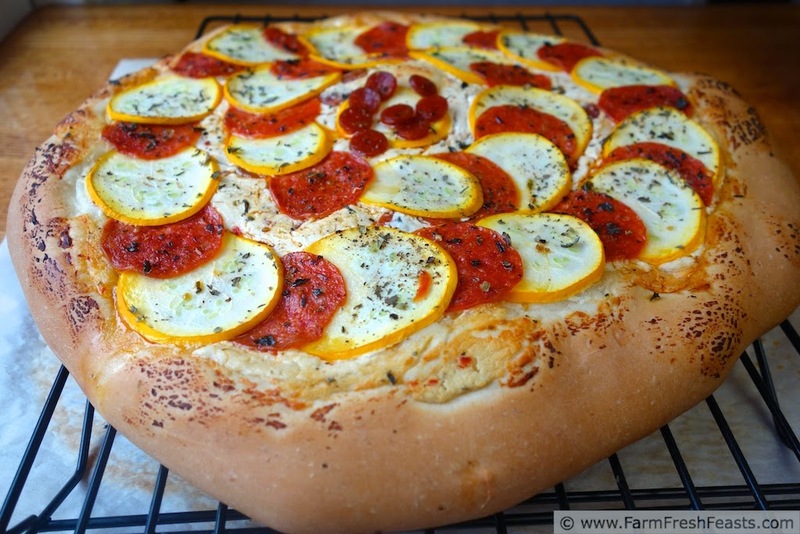 What a nice change of pace your Pepperoni and Yellow Squash Pizza is, it looks mouthwatering. Thanks for the compliment--and thanks for hosting each and every Sunday! What a nice change from a plain pepperoni pizza. I love that you used goat cheese too! I'm visiting from Buns in my Oven link party! We eat pizza darn near every Friday night, so I'm always looking to change things up and keep it interesting (and use the vegetables from the farm share).